· A TEAM EFFORT, NOT INDIVIDUAL. Many certification programs simply review an individual practitioner. LACP Certification is much more holistic and reviews the entire operations of a communications team. · SIMPLE AND EASY VERIFICATION. It's easy enough for any individual to claim certification and difficult to verify. Teams receiving LACP Certification receive a custom web page highlighting their current recognition. · A RANGE OF CERTIFICATION OPTIONS. Other programs are binary—you're either accredited or not, and it's difficult to discern any nuances between practitioners. LACP Certification recognizes a variety of capabilities. · NO SUBJECTIVE TESTING—JUST MEASURABLE RESULTS. LACP Certification doesn't run its applicants through a testing gauntlet to prove worthiness. Instead, we review real-world work samples and commitments. ▪ Three years ago, 'social media' via Facebook, Twitter and YouTube was unheard of as a communications conduit. ▪ Five years ago, blogs were just beginning to become a mainstream source for information and commentary. ▪ Ten years ago, the Blackberry smartphone was debuting across corporate America. ▪ Fifteen years ago, organizations were learning how to embrace the Internet and e-mail as channels for identity and communications. ▪ Twenty years ago, the Video News Release (VNR) enjoyed gaining popularity within organizations. ▪ Thirty years ago, cable television witnessed increasing popularity, opening a spectrum of new content for households. With all of this change, it has become impossible for individuals to become jacks-of-all-trades. Instead, a team effort is increasingly required for outstanding communications. ▪ Green Major Arc — Availability — "Open Communication." Today's communications teams cannot operate on bankers' hours. Whether it's a weekend crisis or late-night updates to an annual report draft, the right person needs to be available at the right time. ▪ Red Major Arc — Capability — "Hot Results." The true merit of communications professionals is found in real-world results, not aptitude tests. 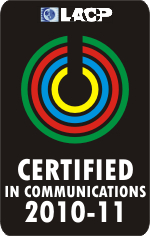 Teams earning LACP Certification have demonstrated the ability to develop and deliver the very best in communications today. ▪ Blue Major Arc — Depth — "Range of Proficiencies." The days of 'jack-of-all-trades' communications has ended. The wide range of communications conduits and specialties now being used requires a team that has proven it has the proficiencies needed to succeed. ▪ Gold Major Arc — Value — "A Wise Investment." Ongoing macroeconomic challenges demand a compelling value proposition from communications teams. Considering ROI, making wise financial choices and offering competitive terms (as applicable) are key. The openings between the arcs signifies the need for all four traits to continually flow and intermingle with one another in harmony—just like teamwork in general. A team cannot be a closed system; it needs to maintain an open interaction with all of its publics continuously. ▪ Foundational Certification Level. A basic compliance checklist and commitment by the communications team to the LACP Certification standards. ▪ Exceptional Certification Level. Graded at four levels ranging from "Platinum" to "Bronze," additional commitments and documentation can be provided to further establish a team's strengths for the respective trait. ▪ Exempt Certification Level. Teams that do not wish to pursue certification for a specific trait/characteristic can "opt out." This is reflected in the team's online profile and available certification logo set, but can be the right choice in certain circumstances. With this in mind, applying for LACP Certification is a simple, three-step process. 1. Download the application and select the appropriate certification levels. For Foundational Certification, a fixed set of basic requirements needs to be met as indicated on the application. For Exceptional Certification, applicants can pick and choose which additional requirements are being fulfilled. For Exempt Certification, the "opt out" option can be selected as appropriate. 2. Submit the completed application via mail or e-mail along with any supplemental information, as applicable. Complete instructions are included with the application. 3. Allow time for processing your application, typically 4-6 weeks. If additional information is required, we will contact you before making a decision on your application. Our interest is to see qualified communications teams earn their appropriate certification, so we'll work with you to ensure your application meets the proper requirements, as appropriate. Those who become Certified will automatically be contacted regarding renewal options at the end of the first year. Why do you offer different levels of Certification? Offering a generic "seal of approval" doesn't do much to help potential clients or other departments to recognize a team's capabilities. Michelin rates restaurants on a scale of stars. The USDA grades the quality of meats from "prime" to "select." Films are often scored on a scale of 1-10. If quality is expected and referenced for an evening out with friends, so should it be for a year's worth of work from a communications team. ▪ 20 points for each Foundational Certification. So, for instance, a team, agency or organization that is Certified in Availability, Capability and Depth would earn 60 points, whereas another applicant certified in all four Characteristics would earn 80. ▪ 1 point for each level of Exceptional Certification. The heightened requirements of Bronze-, Silver-, Gold- and Platinum-Level certification can earn an additional 1, 2, 3 or 4 points, respectively. ▪ 1 point for work sample quality. We review all work samples submitted by the applicant. Quality is rated on a scale of one to four stars and earns the respective number of points. ▪ Public Web Site Analysis. 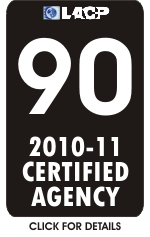 Certified teams, agencies and organizations receive a custom URL at LACP's web site (for example: http://www.lacp.com/xyzagency) that details their performance in the LACP Certification process. (See a sample here.) This link is valid as long as Certification is maintained, and the page's contents are updated to reflect the organization's ongoing evolution in capabilities. CD-ROM for simple and easy ongoing reference. ▪ Certification Plaque. All teams, agencies and organizations that garner LACP Certification also receive a plaque to recognize their distinguished status. Plaques are also automatically provided those who annually re-certify, so it's possible for qualified agencies to develop an impressive string of recognition over the years. Is LACP Certification strictly for US-based communications teams? No. Approximately half of all LACP clients are based outside of the United States and represent upwards of 30 countries on six continents. LACP Certification has become recognized worldwide. How does LACP Certification Renewal work? Certification renewal occurs on an annual basis. Initial Certification will be for at least twelve months and then be due for renewal on the following January or July, whichever is first. So, for example, a firm that is first LACP Certified in April 2010 would not be due for renewal until July 2011. Those who are LACP Certified will automatically receive a renewal form, which is used to update the current status of the organization and development of any new capabilities. Renewal and maintenance fees are a small fraction of the initial Certification Fee. I have more questions—where can I get the answers that I need? Please feel free to contact us.